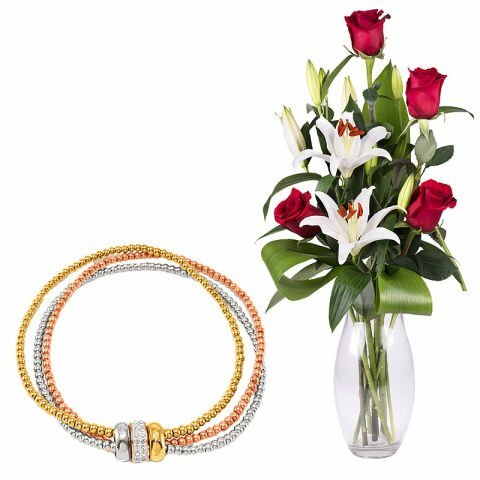 When thinking about what to get that special woman in your life you are probably torn between a beautiful bouquet or a glamorous piece of jewellery. With this gift you combine the two in one. What could she want more? The combination of a bouquet of red roses and white lilies with a triple bracelet from Folli Follie can't be beaten. The daring design features 3 bracelets in varying colours (silver, gold, rose gold) joined together to create one piece of innovative jewellery that she will love. The bouquet of flowers features four premium red roses, complemented by white lilies, greenery, and is adorned with a bow. 3 distinct bracelets joined into one thanks to three gleaming rings. The piece of jewelry is made of one bracelet plated in gold, one in silver and one in rose gold. The rings which join the three bracelets are plated in the same colours, whilst the central, rose gold plated, ring is crystal incrusted. The product comes with a 2 year warranty from the date of purchase. Contact any authorised store that carries the brand to handle concerns covered by the warranty. When thinking about what to get that special woman in your life you are probably torn between a beautiful bouquet or a glamorous piece of jewellery. With this gift you combine the two in one. What could she want more?